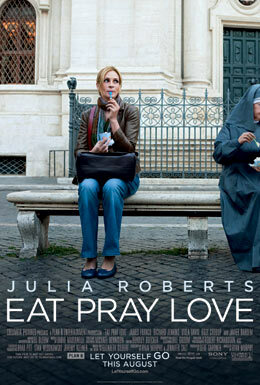 Liz Gilbert (Julia Roberts) is a modern woman on a quest to marvel at and travel the world while rediscovering and reconnecting with her true inner self in Eat Pray Love. At a crossroads after a divorce, Gilbert takes a year-long sabbatical from her job and steps uncharacteristically out of her comfort zone, risking everything to change her life. In her wondrous and exotic travels, she experiences the simple pleasure of nourishment by eating in Italy; the power of prayer in India, and, finally and unexpectedly, the inner peace and balance of love in Bali. Based upon the bestselling memoir by Elizabeth Gilbert, Eat Pray Love proves that there really is more than one way to let yourself go and see the world.